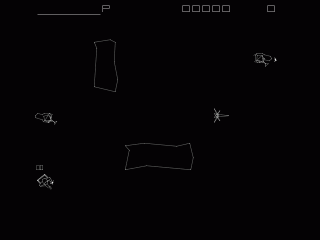 A fast and furious vector game set on a single screen playfield, the main objective of Demon is to collect crystals and return them to your shuttle. 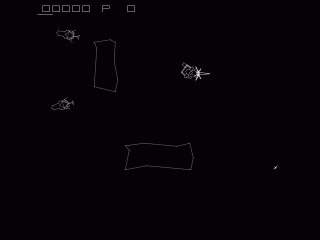 Controls are very basic: left, right, thrust, fire and panic bomb. You simply rotate to face the way you want and thrust to move forwards in your chosen direction. The panic bomb destroys all enemies on screen but can only be used once per life. 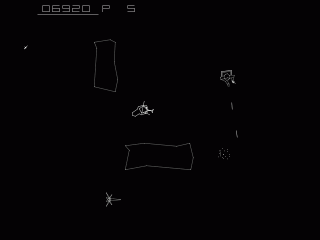 You collect the crystals by moving over them and drop them into the shuttle by moving into it. The shuttle moves across the screen from left to right and when it moves off the right side of the screen, it reappears at a different random height. All the time you are trying to collect your crystals, your progress is hampered by enemy ships which move fairly slowly around the screen with the intention of destroying your ship. If they get to face in your direction for more than a split second they will also fire at you. More often than not, they simply get in your way, and you must avoid them as contact is fatal. There are also two solid blocks on screen which can be used to hide behind or shoot from behind, but they can also hamper your ability to load crystals as the shulttle can move through the blocks. You can fire at the enemy ships to destroy them, and you also have to be fairly quick at loading your crystals, as they explode after a few seconds if not deposited into the shuttle. You also have a limited amount of firepower, but your shots are recharged when you collect a crystal. The enemy ships get more and more aggressive as the game plays out, and the time limit on the crystals gets shorter as well. You also have to deal with mutated enemy ships which home in on your position and move at high speed. Also the crystals will mutate before you can collect them into large deadly missiles which move away from you, and then back to try and ram you. You must shoot them to destroy them. The difficulty level of the game increases progressively as you play, and is noted numerically on screen before you start each life. Scoring: Collecting a crystal: 100 points. up to 1,000 points then back to 100 points. Each second survived: 10 points. Destroying large alien with tail: 1,500 points. Off centre hit on large alien: up to 1,300 points. Destroying a mutated crystal: 400 points. At the start of the game, concentrate on loading as many crystals as you can. Don't worry about the enemy ships yet as they are easy to avoid. The mutated aliens with the tails which appear later in the game are worth the most points. You get 1,500 for a direct hit destroying them, but also points for each near non-fatal hit. Get a few hits off-target if you can, as they can be worth 1,300 points each! Keep an eye on your shot power remaining and be ready to collect a crystal if necessary to recharge. If the shuttle appears on screen level with the bottom block, keep collecting crystals and don't drop any off until the shuttle is clear of the block. You can often lose a life if you are carrying a crystal and can't get to the shuttle before it explodes.